Is there a killer epidemic of meningococcal disease in NZ? In 2018, as of November, 10 people in NZ died of meningococcal disease and six of these deaths were caused by Group W (as opposed to A, B, C, Y, and Z). Historically most deaths in NZ have been caused by Group B so this is a change. Group W has a higher fatality rate (18.2%) than B and C (7.1%). 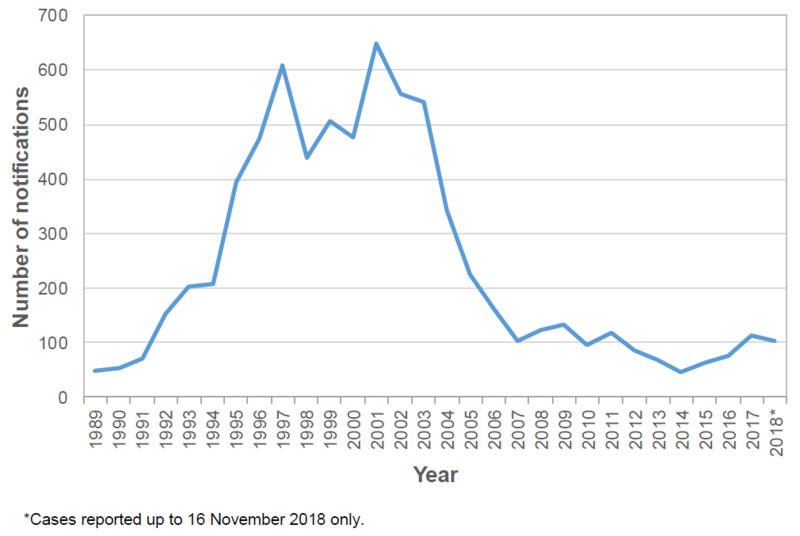 I am starting with a simple graph that shows all the meningococcal disease cases notified in NZ since 1989. It kind of speaks for itself. I think the answer is no, but there does appear a small upswing. Perhaps by the end of 2018 we will land in a similar place to 2017. I have discussed in more detail here. Is type W taking over? Good question, and I think the answer is that we need to take W very seriously. At the moment there has been a global increase in W ST-11 (the scary super virulent one, as if meningococcal was not already horrible enough). Again I will let the graph below do the talking, note how it bounces around. Meningococcal disease notifications by group by quarter by year, 2013-2018* Source ESR. Meningococcal Disease Report. Nov 2018. Right now it is clear that W needs to be on the radar, it has come out of nowhere, as meningococcal does. Also note how the different groups bounce around from year to year, an upswing can disappear as quickly as it appears, like group C in 2013. Why are Northland getting a W vaccine and other places are not? Simple answer – because the people there have the highest risk. Below I have simplified the number of cases of W and rate per 100,000 of Menignococcal disease in people for all the District Health Boards in NZ. A map would be better but I don’t have the software sorry. Data Source: ESR Meningococcal Disease Report. Nov 2018. If we use 3 per 100,000 as a line in the sand for a meningococcal outbreak then 5 DHBs reach that threshold. 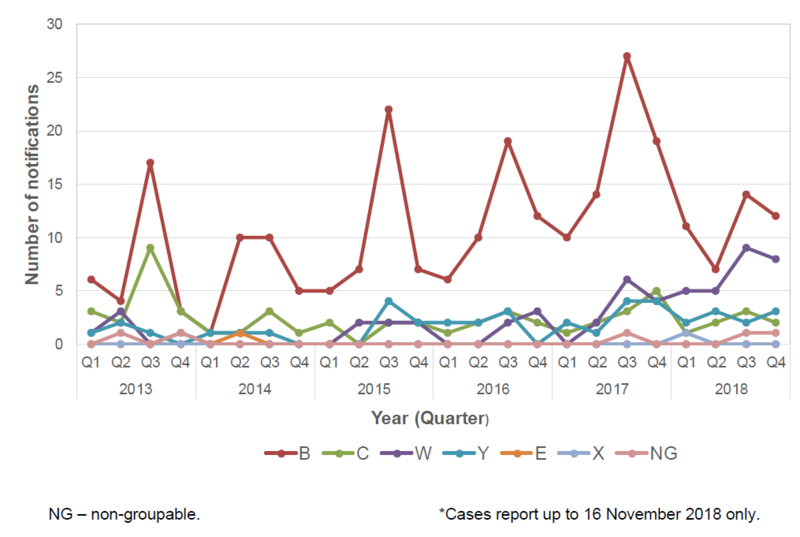 However only Northland has had more than two cases of group W. It is mainly group B that has affected the other DHBs and A) that requires a different vaccine and B) the rate of group B is not at outbreak levels. What about age? Why are only under five year olds and 15 to 19 year olds being offered the vaccine? Answer: Three reasons I can think of. 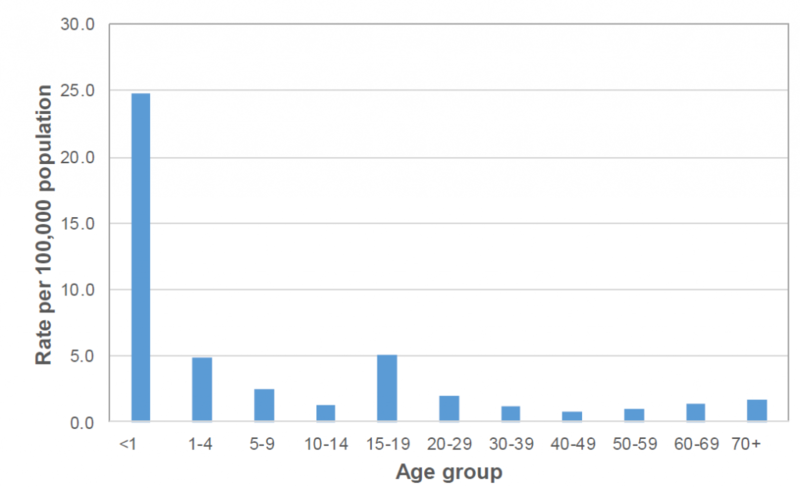 First, the graph below makes this obvious as nearly all disease is in these age groups. Second, the vaccines are expensive (Finite health dollars is an unpalatable fact). Three, there is a global shortage of meningococcal vaccines. Meningococcal disease notifications rate by age group, 1 Jan-16 Nov 2018. Meningococcal disease notifications rate by age group, 1 Jan-16 Nov 2018. Source: ESR Meningococcal Disease Report. Nov 2018. Why is there a shortage of vaccines? Surely this is bad planning. As with any manufacturer, production needs to be planned. Confession – in a past life I was a production planner for a major cosmetic company so this all feels very familiar. Basically, the markets (in this case NZ and other countries) submit their anticipated needs for way in the future. For some vaccines this will be based on tender where we know we need enough of a certain vaccine to vaccinated our birth cohort with the scheduled vaccines. However, there is also estimating the private market demand. This can all be managed quite well. The company will schedule production accordingly and I assume allow some extra for emergency situations such as outbreaks. Vaccines are not made in a day. It probably takes about 2-years to whip up most vaccines like these. Couple that with a limited shelf life, and the fact that unused product will need to be turfed after 2-3 years. Manufacturing enough with minimal waste, guess-timation is an inexact science and hugely challenging. 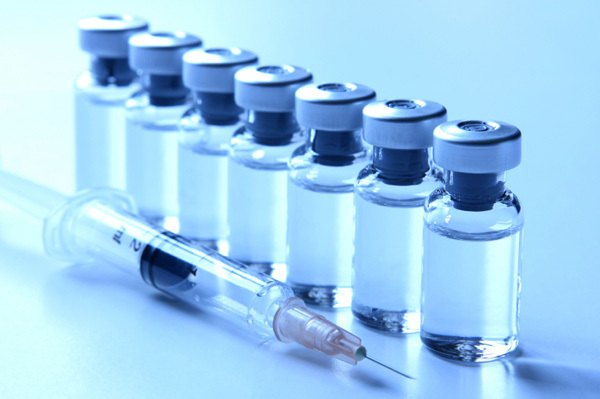 As there has been a sudden unexpected upsurge in Meningococcal W in many countries (including UK, Australia and Africa) there has been a demand for more W-containing vaccine. In NZ we normally only bring in enough for special high risk groups and the private market as we do not have this vaccine on our routine immunisation schedule. That is why we have a shortage. We could not have predicted the jump in W.
There is plenty of the Group B vaccine (Bexsero) in NZ available for private purchase. Most meningococcal in NZ is caused by group B. 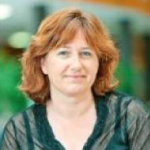 Will you be using information from those using Bexsero for you research, which presumably was funded by GSK?